Now Introducing the Good Samaritan Award! Hirschfeld is celebrating selfless acts of kindness. This initiative is inspired by a member of our team who stepped in to assist one of our residents during a time of need and potentially saved his life. Now we want to take this opportunity to recognize & award those in our community who are lending helping hands and making a positive impact in the lives of others. If you are a resident of any of the Hirschfeld apartment home communities we invite you to nominate the good deeds of any community members you feel have acted selflessly to benefit others within our neighborhood. Feel free to fill out the form below to nominate someone you know. The Hirschfeld Good Samaritan Award is our way of highlighting the good that others do each and every day which sometimes goes unnoticed. Therefore, our goal is to share uplifting stories featuring selfless acts of kindness in and around our apartment home communities while awarding the heroes performing those acts. What is the Hirschfeld Good Samaritan Award? The Good Samaritan Award is our way of showing appreciation for the good deeds going on in our communities. Each recipient of the award will receive an honorary certificate and have their inspirational story shared on the Hirschfeld Blog. 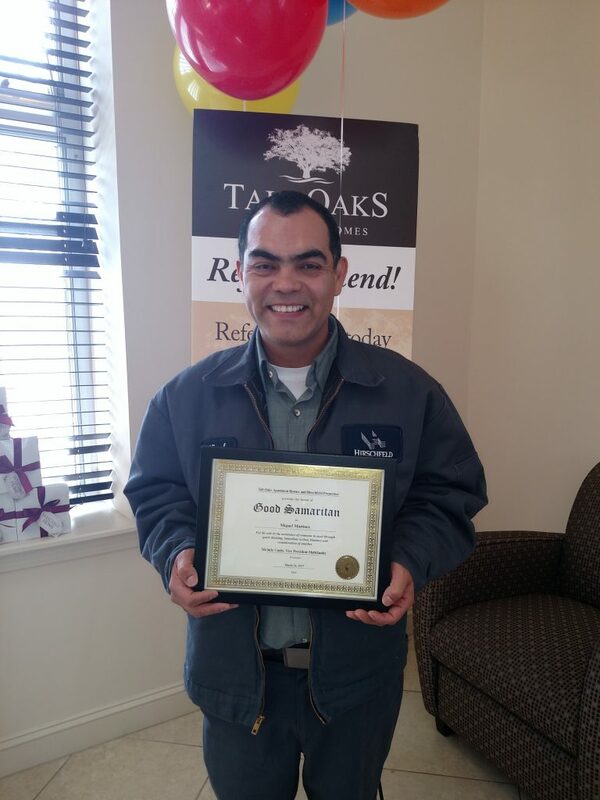 This award program was inspired by our friend and Tall Oaks staff member, Miguel Martinez. His compassion has set us on a quest to find and share other stories like his in favor spreading positive news to our residents, staff, and all who are looking to be reminded of the everyday heroes that exist in our neighborhoods. 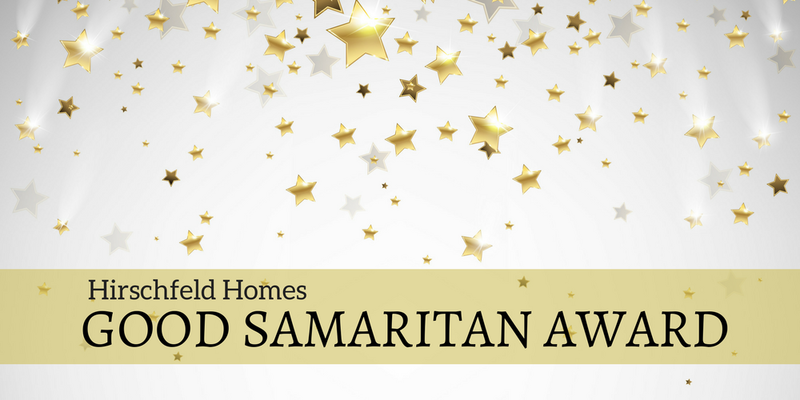 Who is Eligible to Receive the Good Samaritan Award? Resident or Staff member at any one of Hirschfeld Communities. Must have performed a selfless act of kindness which positively impacted another. If you have an inspiring story you would like to share with the community or would like to nominate an eligible hero, please fill out the following form below. We'll be sure to contact you for more details if your nominee is chosen!